What I mean by this is that catch statistics are not a good indicator of how many salmon are present in a river or individual salmon beat and the only way for that to properly occur is for the river management to implement actual fish counter technology if true stock position numbers are to be acquired. If no anglers turn up to fish a river then you have obviously no salmon being caught and so a downward spiral commences. These days digital salmon scores on websites are the main drivers of Scottish salmon fishing which is seriously flawed as is the assumption that every salmon angler who turns up to fish a river knows how to catch salmon. You could easily have a pool full of taking salmon with no salmon fishers present on a beat or poor salmon fishers who miss the hooking opportunities they get offered. You could also have a scenario where one angler is present on a salmon beat who lands 2 salmon and another venue catches 4 salmon with a full compliment of eight fishers present to achieve it making it look better on paper. Personally I'm tired of something as inaccurate as 'catch statistics' driving the entire industry and especially at a time with global environmental uncertainty and natural stock adjustments occurring with many indictor species including Atlantic salmon. In the 70's when I first got involved in Scottish salmon fishing you'd never hear the beat ghillies talking about catch statistics unless they were talking about the total catch for the previous season. That didn't mean that you were guaranteed to catch salmon either as there were 'highs & lows' back in those days too. A big part of the attraction of Scottish salmon fishing is the 'escape' back into the natural world surroundings where our ancient relatives once dwelled and getting as far away from the stresses of modern day living and all the pressures that go along with that. The unpredictability of the sport also adds to the value as if catching salmon was far too easy I'm sure its appeal and challenge would diminish. The salmon rivers of Scotland are much more noble than some inconsistent digit on a computer screen and in the old days as should be the case once again a salmon was always regarded as a bonus and not an expected booking condition. 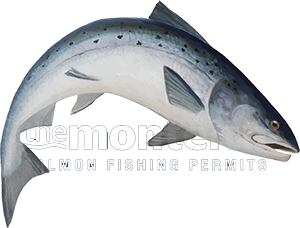 If you're a salmon angler the best approach is to pay attention to your own personal salmon fishing skills and develop these to a point where on a worst case scenario you're able to force a take from a salmon when the water conditions or suspected salmon stock levels are not the best. This is a far more sensible approach than paying too much attention to talentless salmon fishing agent's seriously flawed marketing strategy as overlooking all the other fine attributes of Scottish salmon fishing just makes no sense at all. I specialise in providing guided salmon fishing days for guests who wish a 'professionally' delivered introduction into this fascinating business or for more experienced salmon fishers who are in need of fine tuning. Due to the previously mentioned facts I recently decided to set a salmon beat presentation service to let our generally backward industry see how a salmon beat should be presented as to date the vast majority of Scottish salmon beat presentation as been nothing short of dreadful. Here's an example of what is possible and to my mind given the importance & significance of our industry it is inexcusable for any Scottish salmon beat owner or salmon fishing agent to be operating with any lesser standard.